Some evergreen shrubs lend themselves to topiary and simple sculpture shapes. 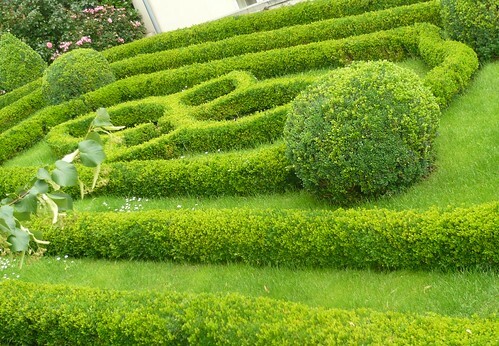 From simple Box hedges as knot gardens to large geometric shapes you can train and prune to get effects with a large range of plants and shrubs. Yew (Taxus) is a traditional topiary subject that stands hard pruning with it’s fine textured needles and moderate growth rates. Juniper is a fine textured evergreen with tree, shrub and prostrate forms that respond to pruning. Holly (Ilex) is a glossy leaved evergreen with various leaf forms depending on variety. It is slow growing and can be trimmed quite hard. Box (Boxus) is useful for smaller sculpted shapes needing fine detail. It is slow growing. Cupressus are often used for spiral shapes or cloud pruning. Bay (Laurel nobilis) has coarse aromatic leaves that are popular for training as a round-headed standard. Select a plant with good foliage and strong stem or stems. Plant it in a prominent location as it will be a feature to see and nurture. It may take several years to get it exactly how you want it so you need access with your shears or secateurs. Encourage new growth at the base of the plant by cutting back upright lower growths to get a broad outline. Remove crossing interior branches and twiggy stems to allow light to reach the interior. Select strong stems to form the framework for the overall shape. Complex shapes may need some stakes or frame work to support the growth. Incorporate them early so they get covered in foliage. In Autumn mulch roots, give a last light trimming and it may be necessary to wrap some sculptures loosely in fiber fleece or sacking to protect against heavy frost. In Spring cut out any shoot tips that were damaged in winter and clean out dead wood and debris. Begin shaping new plants and feed plants when they show new growth. Do not trim buds off floral shrubs. Early Summer requires regular trimming to create and maintain shapes with desired detail. Water the foliage occasionally and keep feeding. Stop pruning in later summer to avoid encouraging tender young growth that wont survive winter. In Winter knock off any snow that builds up on flat topped shrubs. If you move container grown plants under the eaves of the house for shelter remember some water. For hedges, crenelated battlements and trains with or without carriages are popular. Geometric shapes including Spheres, Spirals, Cones, Rectangles and Pyramids. For the adventurous animals, clouds and wall shapes are popular. Use small leaved shrubs for detailed shapes. Visit some Topiary gardens or select by clicking on a book from Amazon for more ideas. Topiary is the art of training, clipping, trimming and pruning evergreen trees and shrubs into shapes. 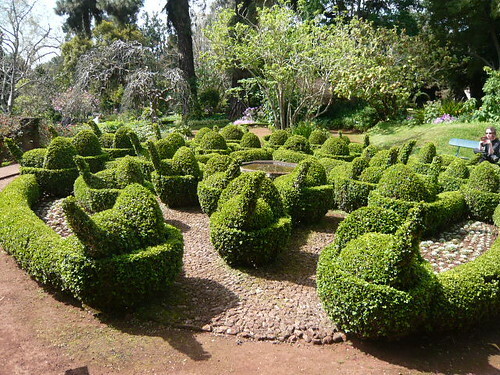 Often the result is a formal geometric shape that enhances the design and formality in a garden. If you are interested in Topiary or want a day trip then below is a list of gardens worth visiting. 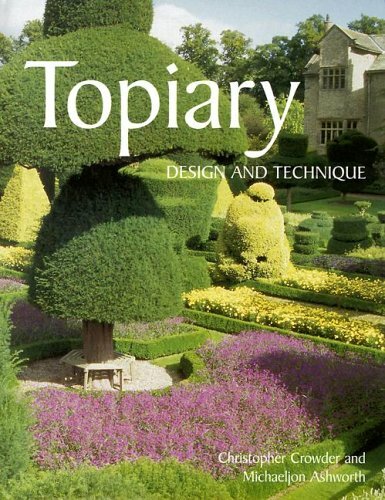 Should your interest be deeper then the ‘European Topiary Society’ has a lot of detailed information on the web site. For a spiral effect use string tied to the top and circled around and down to outline the shape prior to cutting with topiary shears.